If you want to download a project you see on this site you need to understand the different options that may be available. The first is called a world save, it is what minecraft actually reads to load different maps and levels. It includes all the terrain, buildings, map info and other items that the game uses to compose a complete world you see in the selection screen. It is the most common type and can be played without having to use any other programs. World saves are not a single file, each world has its own folder containing a level.dat file and a few others the game uses. The second type of file you will find is called a schematic. This is a special type of file the can be used with MCEdit and a few other minecraft editing programs. A schematic file is different from a world save as it is a specific section of blocks that are saved instead of the whole world. They can vary greatly in size and content from something as small as a single block, to a large building or even a whole map. They are best used to copy or import single items into your own minecraft world save. The third type is called a zip or rar file and is not directly related to minecraft. These are compressed files that are often used to “merge” multiple files or folders into a single one for ease of sharing or storing. Once zipped, all you need to do is extract them to get the original contents. You may need an external program to do this if your OS doesn’t have something built in. Now that you have a project world or schematic all downloaded and unzipped, all you need to do is install it and start playing! If you are using a schematic file I will assume you have MCEdit installed, if not, download and install it now. After you have it all setup, open the program and select the world from the list that you would like to add the schematic to (If none are on the list you will have to click the “Open a Level..” text and find it in the file browser.) After you selected your world and have it loaded you need to click the import button (little red crane) on the bottom right, find the schematic in the file browser and click open. It will load the schematic under the mouse allowing you to move it around. After you place it in a good spot, click the import button to complete the operation. Now hit Ctrl+S to save the world, then Ctrl-W to close it, after which you can exit MCEdit. That’s it, all you have to do now is open the world in minecraft and behold your new items. I highly recommend backing up your minecraft files! This includes your world save files and bin folder. If you haven’t already, please read the file types and installing sections as a lot of it applies to this also. 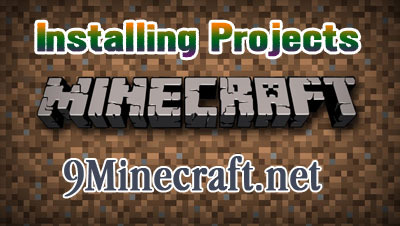 To backup your world files all you need to do is copy the specific world save out of the .minecraft/saves folder, as mentioned in the installing section, and paste it to a another location. This is good to do if you are testing new ideas or have just done a lot of work to something and want a little peace of mind. The other item you may want to backup is your minecraft bin folder or jar file. There are several reasons to do this including accidentally updating your game version which breaks old mods or installing new mods that “black screen” the game. The bin folder is located in the main .minecraft directory like the world saves and contains the minecraft.jar and a few other files. I normally copy the whole bin folder when backing up but you may get away with just saving the jar file. Once you its copied just paste it to another location and you’re set. Uploading a world save is just like downloading and installing, except you do the steps in reverse. This means you need to find the world save folder you want to upload, create a zip file with it, then upload it to a fire sharing site like mediafire. Once its uploaded you just need to copy and paste the link to the “world download url” field in your project. Schematic files can actually be uploaded directly to this site without having to use another host.